The newspapers and the reports, especially The Jewish pogroms in Odessa and surrounding area in 1905, by S Semenov, tell the stories of individuals caught up in the pogrom, and the Semenov report, quoting from the government report, includes specific house numbers where many inhabitants were killed and eyewitness statements to the police. By checking through some of these stories I thought it might be possible to get a better idea of whether the pogrom death records included many or all of those who died in the pogrom. For instance, the Jewish Chronicle article below mentions whole families that were wiped out in the Slobadka area. This was reflected in the death records for the Weitzman family who had four members in the records, but there is only one member of the Davidovich family and no one from the Rubinstein family. In the next article, Vyssotosky was obviously a well known member of the self defence league and is designated in the records as a teacher. The little girl, Elena Isaakovna Weingurt, 2 ½ is also in the records, one of the few children of such a young age. In some places whole families were wiped out (Davidovich, Weitzman and Rubinstein, on the Slobodka). On the Moldovanka the hooligans killed a father and mother before the eyes of their son, a boy of 10. A Jewish female teacher was hastening to the house of her parents in Peressip when she was stopped by a ruffian who, assuring her he was not going to do any harm, as her to show him her teeth. To humour him she opened her mouth into which he immediately fired, killing her on the spot. Another incident is now corroborated by a Sister of Charity. A man named Leon Vyssotosky was wounded while fighting front rank of the defenders. He was placed on an ambulance to be removed, when he was violently dragged to the ground by soldiers and then handed over to a disguised policeman, who put an end to his sufferings. Vyssotosky was one of the most energetic members of the Self Defence League, and was a remarkable orator. It is presumed that he was known to the police as such, and this was the reason of his being murdered. Yet another horrible story. In Prochovskaya Street, while the pillage went on, a Sister of Mercy drove along with the wounded old man in her carriage. Four little children ran crying in the middle of the street, begging her to take them to their parents, whom they could not find. Before they could reach the carriage, two were shot and the other two run through by bayonets. In the same street five children were thrown out of third story windows. Two of them, one two months and the other 12 months old, died immediately. I tried to find out more about Elena and her family. The Hotel Imperial was at 25 Deribasovskaya, the street where Kamensky lived, across from Gavannaya, where he watched the demonstrators coming down the street. 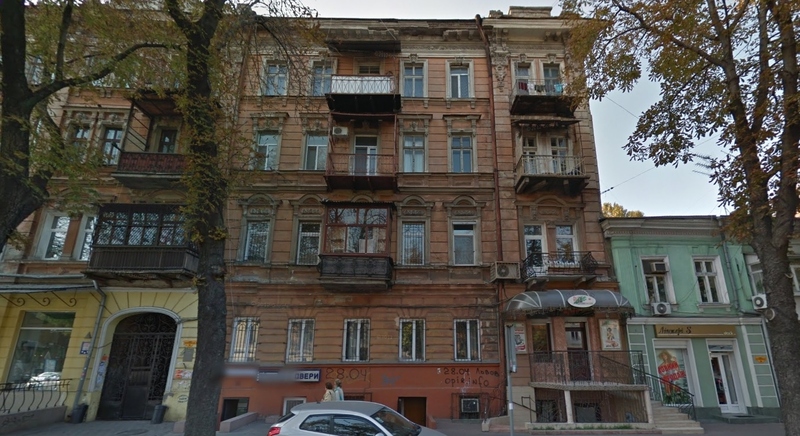 So Kamensky must have lived near the hotel and Elena, according to his story, would have been living across the road at number 18 or 20, which are now modern buildings. The hotel was demolished in 2008 and now there is a new hotel there. 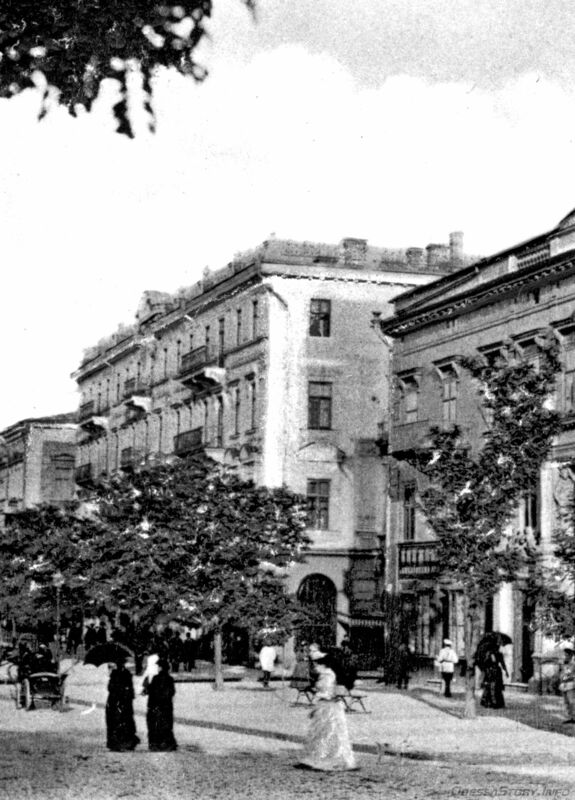 Several Vaingurt families owned property in the centre of Odessa and there were three named I Vaingurt, listed in the 1902-3 directory, one at 55 Bazarnaya, at the corner of Ekaterininskaya, a long two-storey house, one at 93 Bolshaya Arnautskaya, a four-storey house, and the other at 70 Ekaterininskaya, at the corner of Bolshaya Arnautskaya, a more ornate four story house. They are within a hundred yards or so of each other. There were also two houses owned by R Vaingurt and two by X Vaingurt. Many of the following photographs are taken from Google Streetview. In the 1904-5 directory the 70 Ekaterininskaya house had been sold, so the only four-storey house was 93 Bolshaya Arnautskaya. 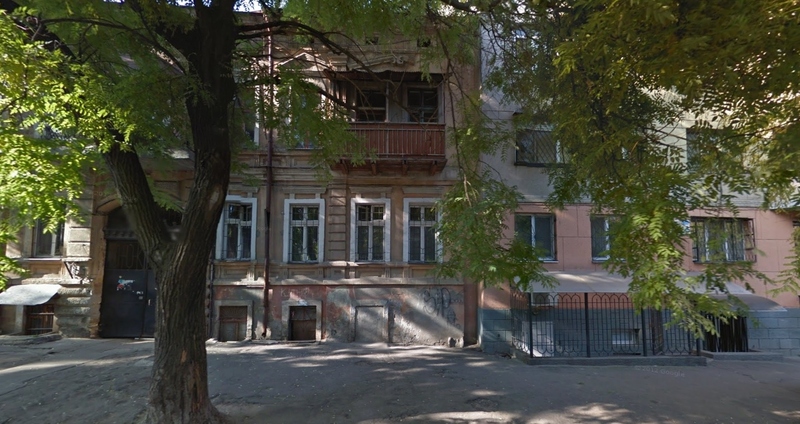 The question is whether Elena’s father, Isaak, and his family were living in their house at 93 Bolshaya Arnautskaya, or on Deribasovskaya, as described by Kamensky. In the 1904-5 directory, an Isaak Abramovich Vaingurt was dealing in wholesale colonial grocery products at 55 Ekaterininskaya (which is listed in the directory as a Greek Orthodox Church). After the pogrom, in the 1907 directory, Isaak Abramovich was living at 64 Ekaterininskaya, working as a commercial agent or middleman, and an Isaak I was a merchant of the second guild, someone of substantial wealth. Isaak Abramovich now owned 91 Bolshaya Arnautskaya , so I assume he is the one who owned 93 Bolshaya Arnautskaya, and he was sharing 64 Ekaterininskaya with Isaak I. Another Vaingurt, Abram Isaevich, possibly the father of Isaak Abramovich, and brother of Isaak I owned 55 Bazarnaya, which was the section of the house around the corner from 64 Ekaterininskaya. If Isaak Abramovich is the son of Abram, and nephew of Isaak I, it makes sense that he is the one with the young daughter. Selling 93 Bolshaya Arnautskaya immediately after the pogrom seems to indicate that the family had been living at 93 Bolshaya Arnautskaya during the pogrom and that he could no longer bear to go on living there after his daughter died. 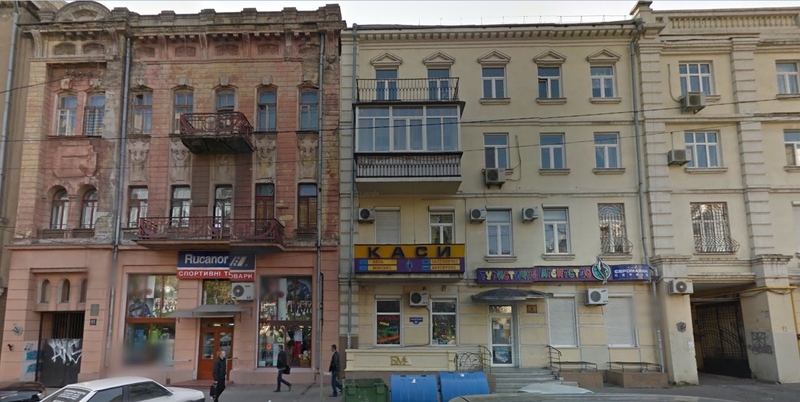 There were 11 Vaingurt families in Fond 359 Odessa office for small business, Jewish section 1893-1916, mostly owning businesses during the period 1898-1914, but none with the name Isaak. 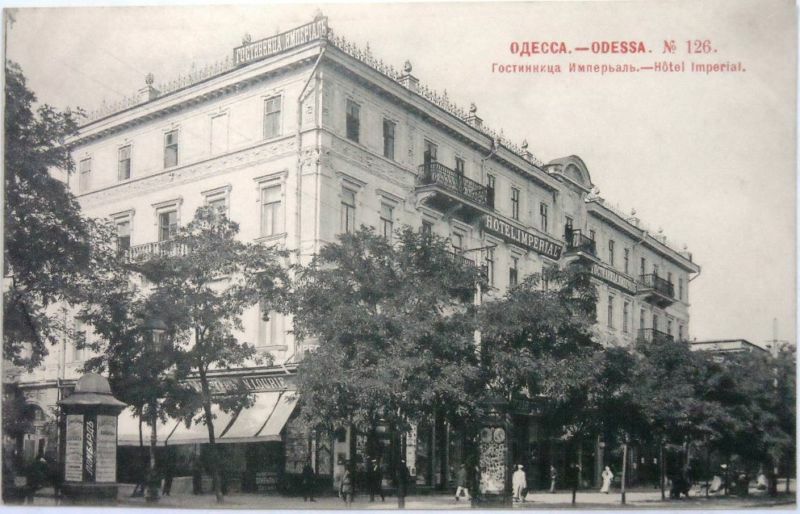 There was one Vaingurt who had a business in 1898 at Deribasovskaya 25, at the Hotel Imperial, possibly a shop on the ground floor, because the hotel was owned by someone called Elman. The window Elena was looking out of, sitting on her father’s lap, will remain a mystery, but I imagine it was one of the fourth story windows of 93 Bolshoi Arnautskaya and Kamensky simply heard the story and made it his own. Вайнгуртъ, И. И. Екатерин.,64; 608. Вайнгуртъ, И. А. Екатерин. 64; 522. Вайнгуртъ, А. И. Базарн., 55; 328; 605. The author of the article Pogroms: what happened in Odessa, O. Ilnitskaya, concentrated on describing the Jewish self-defence groups, the members of which numbered more than 2000, 55 of whom were killed. She also tells the story of her own father, who was a teenager at the time, living at the corner of Bolshaya Arnautskaya and Gimnasicheskaya, only a couple of streets away from the Vaingurts. Similar to the story by Korsunsky’s granddaughter, Ilnitskaya’ s father said a border guard officer lived in the building and had two armed soldiers placed at the gates to prevent harm to any Jews in the building. Either many Jews had the luck to know policeman or soldiers who guarded their gates and managed to keep out the hooligans, or this was a story that people told to hide the truth. There were other general stories of violence on several streets in the centre, in the newspapers and Semenov report, such as Pushkinskaya and Uspenskaya, also near the Veingurts, pillaging at the corner of Ekaterinenskaya and Evreiskaya, and incidents at Preobrazhenskaya and Politseiskaya, and Pushkinskaya between Novorybnaya and Malaya Arnautskaya. There was also looting in many of the Jewish shops in the centre. This Odessa map from 1888 has the clearest street names of the old maps of Odessa but a few of the names have changed, such as Beznmyannyi, (6) on the map, which must have been changed to Gimnasicheskaya after a school was built there. The red numbers on the map refer to the places where pogrom deaths or destruction may have occurred according to the reports and stories. The demonstrators marching on the first day of the pogrom and later crowds of hooligans covered much of the centre but it is obvious from the map that the lower area, near to Moldovanka, and the more residential right-hand side, probably took the brunt of any violence. 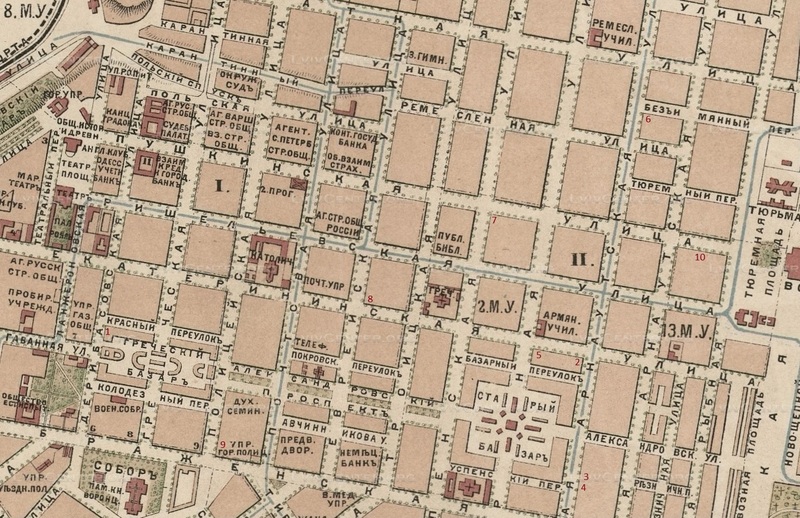 The streets on the left-hand side of the map were the main shopping, hotel and theatre area. But most of the stories of the pogrom in the centre of the city are about random killings like that of Elena. The major violence of the pogrom, where all the inhabitants of some buildings were slaughtered , took place in the predominantly Jewish area of Moldovanka, which bordered the centre, and the further away working class areas, separated by valleys and cliffs, Slobodka Romanokov and Peresyp, near the docks. 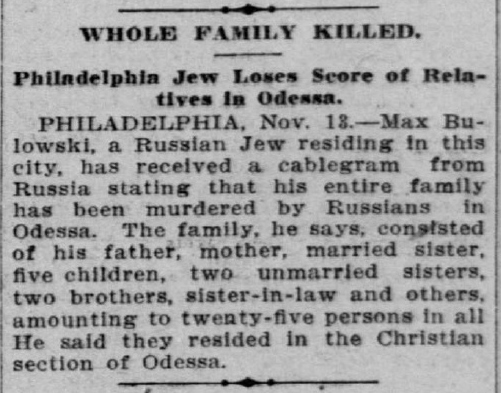 A final story of a family being killed, possibly in the centre of Odessa, was a Philadelphia news item in a San Francisco newspaper about a young man called Bulowski who received a telegram that his entire family had been wiped out by the pogrom. None of this family, at least those with the name Bulowski, are in the records. As the first newspaper article quoted at the beginning mentioned several whole families killed, although not necessarily listed in the pogrom death records, in the area of Slobodka Romanokov, I will turn next to information about those families.